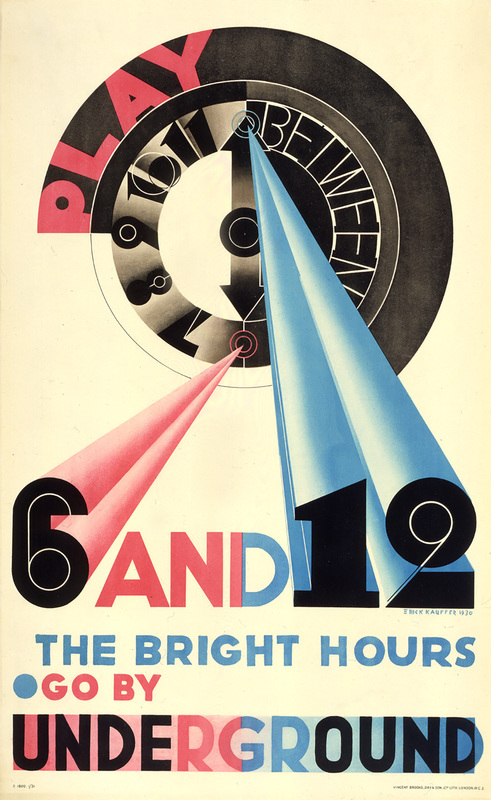 For the first 18 years of my life I lived next-door-but-one to the house of Frank Pick, who, as the first chief executive of London Transport, developed its distinctive aesthetic. Alas, Pick had died 20 years before my family moved into his road in Hampstead Garden Suburb in north-west London, and the blue plaque commemorating him was the only reminder of his presence. Or so I thought until I began my daily journey to school on the underground. Pick’s legacy was everywhere, and remains so today. Every time we see Edward Johnston’s typeface on the signage, or the circle-and-bar “roundel” of the underground’s logo, or Harry Beck’s diagrammatic London tube map we have Pick to thank for inspiring and promoting it (although Pick was originally a little sceptical about the radical circuit-board design of Beck’s map). And every time we glance at a promotional poster as we scurry between stations we have Frank Pick to thank too. He began his career as the underground’s publicity officer, an appointment that surprised many: when he took up his role in 1907 his chief experience had been as a solicitor and statistician. 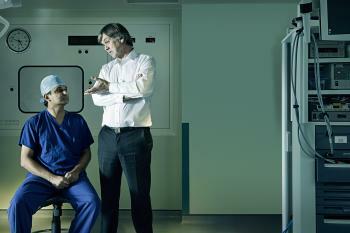 But it was brilliant casting, and Pick soon proved himself a tireless communicator. The underground was, by design, a dark and sometimes fearful place, and Pick resolved to make it less so. He threw in light, creativity and humour, and his work was so influential that, even in its infancy, it was clear he was branding London with an indelible new identity. It is anniversary season for Pick and those he set to work. 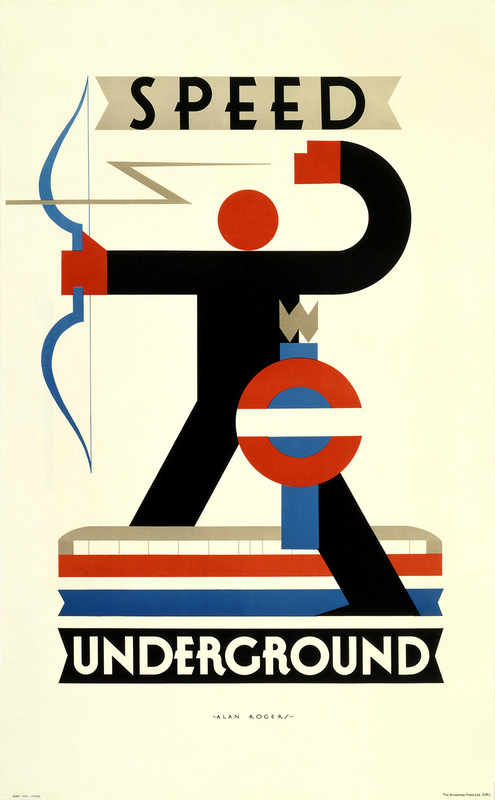 The Johnston Underground typeface is 100, while Pick died 75 years ago. To commemorate Pick’s achievements, the artists Ben Langands and Nikki Bell have created a permanent work in his honour at Piccadilly Circus tube, a roundel sign with his name at the centre, alongside eight words they found scrawled in his notebook: Beauty, Immortality, Utility, Perfection, Goodness, Righteousness, Truth, Wisdom. 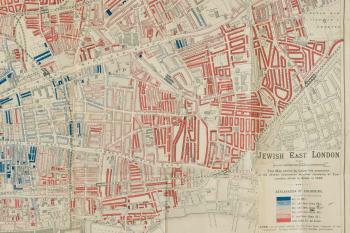 Here is a small selection of posters from the series Pick initiated in 1907. This is believed to be Pick’s first commission. Hassall was already celebrated for his theatre posters, in which he recreated scenes from plays. 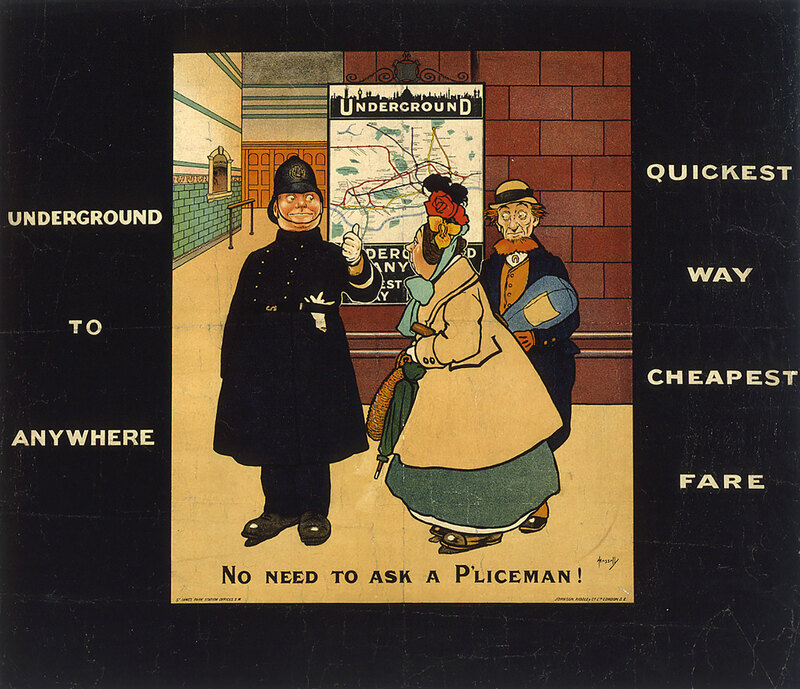 Here he illustrates a scene familiar to anyone who’s ever lost their way on the tube – though the jolly copper isn’t much help. The map to which he is referring the travellers was in fact thoroughly confusing at the interchanges. These were the days before Harry Beck had clarified its design. 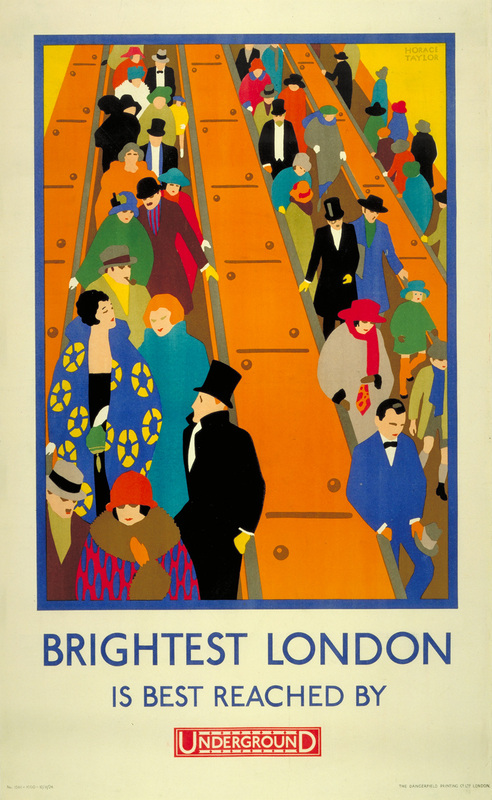 Taylor, who had started his career as a stage designer and as a cartoonist for the Manchester Guardian, wanted to dispel the idea that the tube was a dark, dank and dismal place (and maybe dangerous too). Why, even people with top hats and furs packed the escalators after a spiffing night – including Taylor, who often made cameo appearances in his posters. In this one, he is the bearded man in a top hat standing on the central escalator. This was another of the great persuasion posters, and its bold style drew something from Soviet propaganda. While the tube often got you across town faster than a car or tram, you’d have to be wildly optimistic to compare the experience to a flying arrow. Pick began commissioning Kauffer, an American-born artist, in 1916. 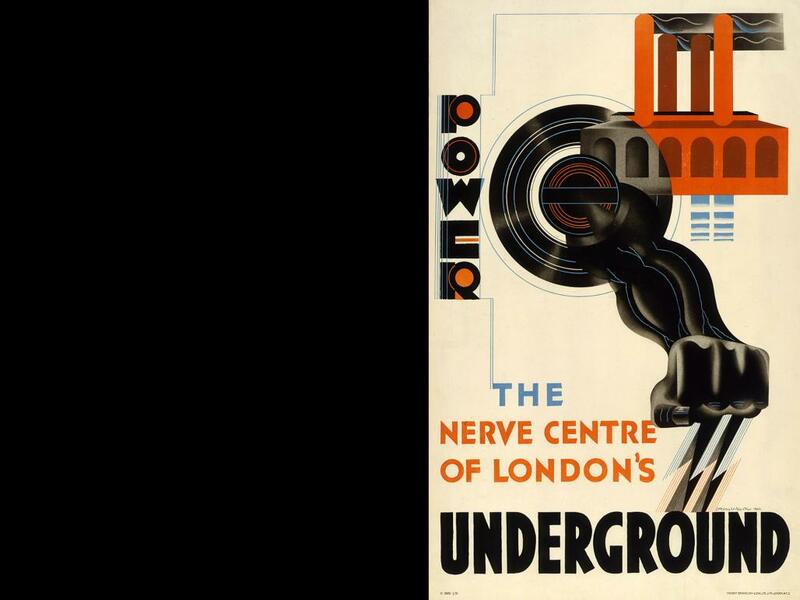 He went on to produce well over 100 posters, including many of the most striking and enduring designs. He was one of the first to show that the poster needn’t be merely utilitarian, that it could be an art form in itself. And his advice for revellers remains useful and true to this day. From the very beginning, Pick was a great champion of modernist artists. 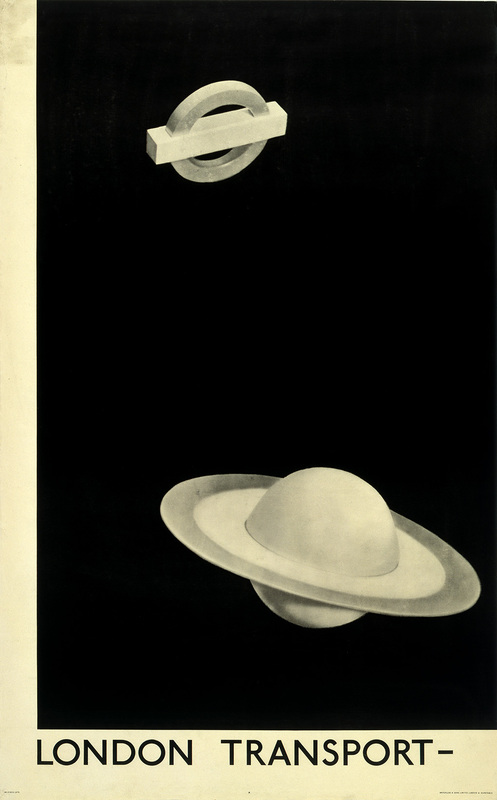 This poster by Man Ray, a photograph that was made without a camera by placing objects directly onto the surface of light-sensitive paper and then exposing it to light, was unlike anything that came before or after it. Its meaning is anyone’s guess. Was travelling in London like being transported to another planet? Were you entering a black hole both literally and cosmically?